The development of this amazing power drink comes from a mania I have had since college back in the 1960s. I was obsessed with recouping nutrients most people saw as “throw away”. Obviously, the liquid left in the pot from cooking vegetables or meat, had flavor. It also had to have nutrients. I used it. Lots of it. I made my own cottage cheese and wondered about the whey. No one talked about using whey or about whey having any value back in the 1960s. Although I was an English major, I found my way to the Homemaking Department to ply the professors with whey questions. Yes, whey had nutritive value and yes, there was research going on right now. Decades later whey powder has become a regular offering on the health food store shelves. This philosophy came to mind as Amanda and I were blanching nettle leaves for the freezer. You have to realize we do nothing in a small way. We were blanching several batches of nettle leaves, one batch after another. We were left with a giant pile of nettle stems. I stuffed them into a five gallon soup pot and covered them with water, just enough to cover the mountainous pile. We brought them to a boil, turned off the heat, covered the pot, and let the mixture sit overnight. The next day we had an extremely strong nettle infusion made only with nettle stems. “What will this taste like?” I wondered. It was not quite drinkable — dark green, earthly, and the texture is almost gelatinous. The taste was not bad but the texture was strange. Given the size of the nettle project, we had enough nettle liquid to last through two weeks of drinks. It held up well and so did we! Since then, we keep ingredients for these drinks around through the spring to help Frederick fight seasonal allergies. You can see here that nettle is a powerful allergy-fighter for him. Use this flavor combination to cut the dense earthy flavor of your nettle, be it a tea made from fresh or dried leaves or the stems as in our case. Orange simply sits well with nettle. As a rule of thumb, about one half orange juice and one half nettle infusion is quite pleasant, but it does depend on the strength of the infusion so adjust the proportions for your own needs. 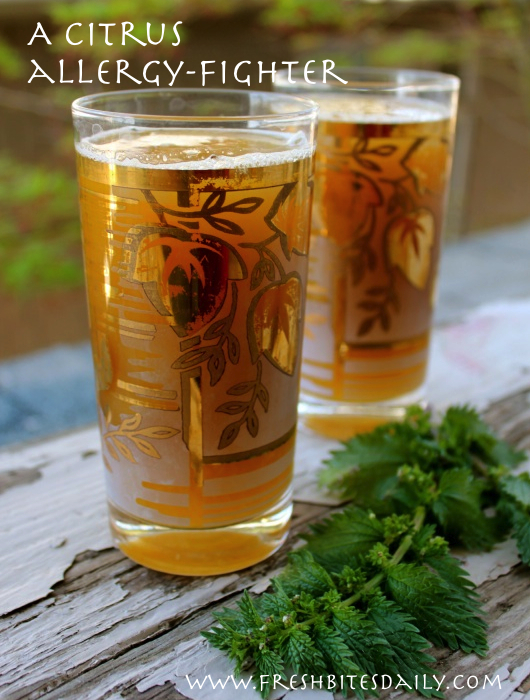 For detailed information on making nettle teas and infusions, read more here. Amanda’s note from Frederick’s dentist: Frederick relies on this drink for about six weeks in the spring which means he drinks a juice diluted with nettle daily. The dentist recommends rinsing after drinking it because of the high sugar content in the juice. The dentist also warned about brushing directly after drinking a high acid drink — rinse first and then brush, as relevant. 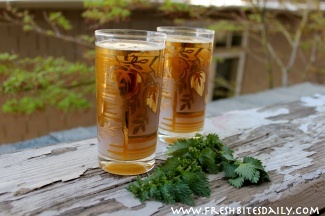 2 Comments on "A refreshing way to down a bunch of nettle tea"
Do you think the infusion would freeze well? It sounds like it would also be a good addition to soups. What do you think? Sorry I missed your question, Brenda. Yes, it sure would freeze well. I have some defrosting right now.